Professional tile and grout cleaning is important in making sure your floors look as good as the day you moved in. Professional tile and grout cleaning can ensure that your floors are not only gorgeous, but it also provides a deep cleaning. When choosing a professional tile and grout cleaning company, you want to choose a company that provides excellent cleanings and awesome customer service. KIWI Services is the perfect company for just that. We have 30 years of experience in cleaning tile and grout and we are the #1 choice for floor cleaning in the area. When KIWI comes to clean your tile and grout, we send out the best cleaning technicians in the area. Our technicians are professionally trained to deep clean your tiles. We use industry leading tile and grout equipment and our cleaning solutions are environmentally and family friendly so you don’t have to worry about breathing in any harsh chemicals. 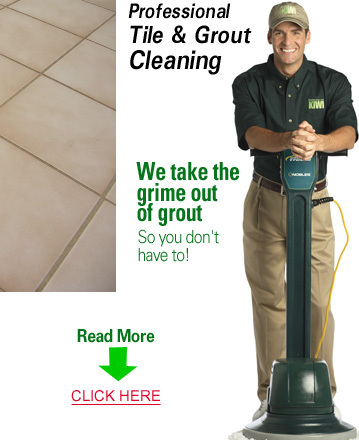 We also offer a grout sealant that will keep your floors looking great longer. KIWI sets out to provide the best customer service in the industry. Our customer service representatives and technicians are able to help you with any questions or concerns you may have. KIWI also backs all of our tile and grout cleaning services with a 30-day clean guarantee, so if you should run into any issues, give us a call and we will be back out right away to provide a complimentary re-cleaning.